Quirky Jessi: You found something....now go find another something! 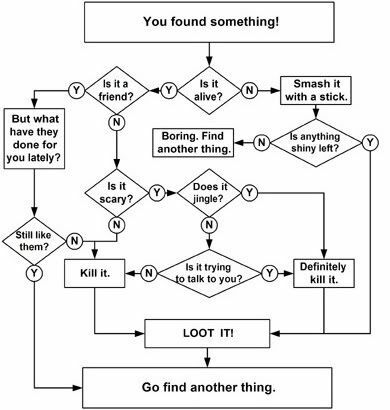 You found something....now go find another something! Another harsh reality of gaming is that there's a lot of, well, repetition. Whether it's going around and around the same board or killing the same stuff over and over again, nothing is ever going to be distinctly different from the last thing you just did. The picture above always makes me giggle because it's so true of MMOs (massively multiplayer online game....for example, World of Warcraft, as I mentioned yesterday). There's a little variation here or there. A new landscape. A new creature to kill. In the end, though, you're just going to be sent to go find something else.